A Chinese astronaut has become the first in his country's history to take a walk in space. In an operation broadcast live on national TV, fighter pilot Zhai Zhigang emerged from the capsule orbiting the Earth to wave a Chinese flag. Mr Zhai, 42, stayed outside the capsule for 15 minutes while his two fellow astronauts stayed in the spacecraft. The exercise is seen as key to China's ambition to build an orbiting station in the next few years. Mr Zhai began the manoeuvre just after 1630 Beijing Time (0830 GMT) on Saturday, and completed it about 15 minutes later. "I'm feeling quite well. 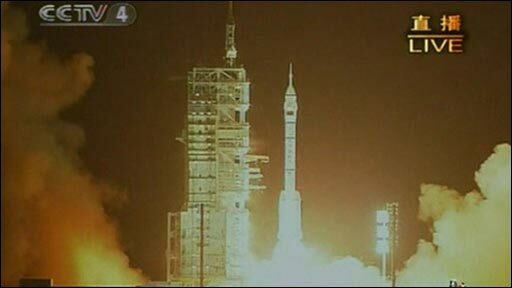 I greet the Chinese people and the people of the world," he said as he climbed out of the Shenzhou VII capsule. His colleague, Liu Boming, also briefly got his head out of the capsule to hand him the flag. 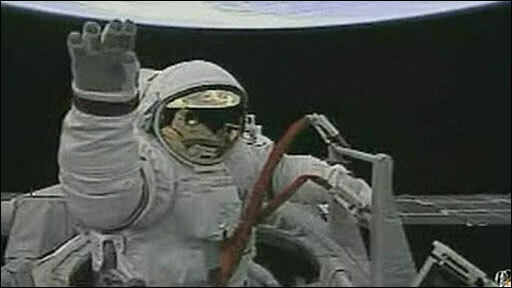 Mr Zhai wore a Chinese-made spacesuit thought to have cost between £5m and £20m ($10m-$40m) for the space walk. The "yuhangyuan" (astronaut) was tethered to the capsule with an umbilical cable. Mr Zhai retrieved an externally mounted experiment. The third yuhangyuan on the mission is Jing Haipeng. The Shenzhou VII capsule soared into orbit on a Long March II-F rocket from Jiuquan spaceport in north-west China on 25 September. The rocket put the Shenzhou capsule in a near-circular orbit more than 300km above the Earth. Earlier, Zhang Jianqi, one of the chief engineers for China's space programme, said keeping three men in the spacecraft, and then sending one outside, would be a "big test". "This is a big technological leap," he told state-run news agency Xinhua. "The risks are quite high. Sending up three astronauts is a jump both in quantity and quality." The ship is to release a 40kg (90lb) satellite which will circle the orbiter and beam back images to mission control. At the end of the mission, the Shenzhou re-entry capsule will target a landing in north China's Inner Mongolia Autonomous Region. China became only the third nation after the United States and Russia to independently put a man in space when Yang Liwei, another fighter pilot, went into orbit on the Shenzhou V mission in October 2003. Two years later, Fei Junlong and Nie Haisheng completed a five-day flight on Shenzhou VI. According to the Associated Press news agency, Xinhua posted an article on its website prior to the lift-off that was written as if Shenzhou VII had already been launched into space. The article reportedly carried a date of 27 September and came complete with a dialogue between the astronauts. Chinese media report that this latest mission is the "most critical step" in the country's "three-step" space programme. These stages are: sending a human into orbit, docking spacecraft together to form a small laboratory and, ultimately, building a large space station. The Shenzhou VIII and IX missions are expected to help set up a space laboratory complex in 2010. China launched an unmanned Moon probe last year about one month after rival Japan blasted its own lunar orbiter into space. What's driving China space efforts?